So in my work I get a lot of questions about when people should retire etc. I have developed a series of things to think about that I thought might be helpful to pass along. I apologize in advance for the length of this post but wanted to throw it all down. If your nt interested feel free to hit back. No worries! :) The reality is everyone is different, has different needs, goals and resources but hopefully this may help some people who are in the "I'm going to retire in the next few years" mode but aren't sure what questions to ask or how to determine the best way to do it. I'm happy to answer any questions anyone may have if it raises them. So what usually happens is I get a call from someone who is fed up and says "I've had it....for the $75K a year (or whatever the number is) they can go pound sand! I'm retiring." And my typical response is "Before you do anything lets go through the math and see what the impact of retiring today is (versus a year from now....2 years from now etc.). So in this example the guy is 65 and makes $75K a year. He has $500,000 in a 401(k) but no other pension benefit. The company provides a 50% match on contributions to the 401(k) up to 6% of salary. If he stops work now he gets $1,650 a month in SS benefits. (SS will increase your benefits from 7-9% per year from your FRA (Full Retirement Age) up to Age 70 and will decrease them for every year BEFORE your FRA down to age 62- so there is a lot of leverage in when you start to take SS Benefits). For this I assume the 401(k) earns 6.5% per year. A salary of $75,000. If he contributes the 6% to the 401(k) to get the maximum match he will have contributed $4,500 and the match will add $2,250 to it. With the 6.5% growth his 401(k) balance will be $539,688 at the end of the year. And he will be eligible for the $1,650 per month in SS benefits. So the work for the 1 year provided a total increase to his household of $114,688 ($75K plus the increase in the 401(k) of $39,688) (This is the "simple" math- yes its a little more complicated because some of the growth in the 401(k) is his contribution, but you get the point). And at that point if he retired and used his 401(k) to provide an annuity plus social security he would have annual income of (approximately) $57,266 ($37,466 from the 401(k) plus the monthly SS benefit of $1,650 a month ($19,800 per year). Salary was $77,250. Now the balance of the 401(k) is $582,172. So for that additional year he received $119,734. most times that is where I will ask the question- "okay, you wont stay for $75K...will you stay for $119.7K? If they gave you an almost $45K raise would you work another year? Because that's what you got...you just gave it to yourself." Now when we look at the "income side" as before he can get annual income of $62,944 per year ($41,560 from the 401(k) plus the new SS Benefit of (approximately) $1,782 per month for an additional $21,384 per year. So now his expected income in retirement has grown by $5,600 per year or 10%. Salary is now $86,945 per year. the 401(k) has now grown to a value of $784,018. His annual income when he does start taking it would be $93,000 per year ($64K from the 401(k) and $29K from SS). This represents an increase in annual income in retirement of $35,900 per year versus what he would have gotten at age 65, or a 62% increase. Now I realize not everyone is willing to stay on at a job they are unhappy with for 5 more years. But the point is that the leverage created by working another year (or 2 or 3) etc. is dramatic. 401(k) (and IRA's etc.) are like making a snow man....when you start pushing the snowball the snow that is collected is very small....but as time goes on the snowball grows and it keeps picking up more and more snow. By the time you are contemplating retirement, your "snowball" (account balance(s)) are the largest they have ever been (presumably) so anything you can do to NOT start taking that money will have a huge impact year over year. Even working part time for a couple of years can help- just by NOT taking money out of your 401(k)/IRA. Obviously there may be asset allocation decisions you need to make to reign in your risk profile as you get closer to that retirement and that is appropriate but keep in mind that with life expectancy for men age 65 at about 87, even when you retire you are still a long term investor so should have some money in stocks to ward off the impacts of inflation. Everyone needs to determine what that amount is so I am not saying have it all in stocks by ANY stretch, that would not be smart. But for most people, your cost of living will double while you are retired (with inflation of 3.5% per year). 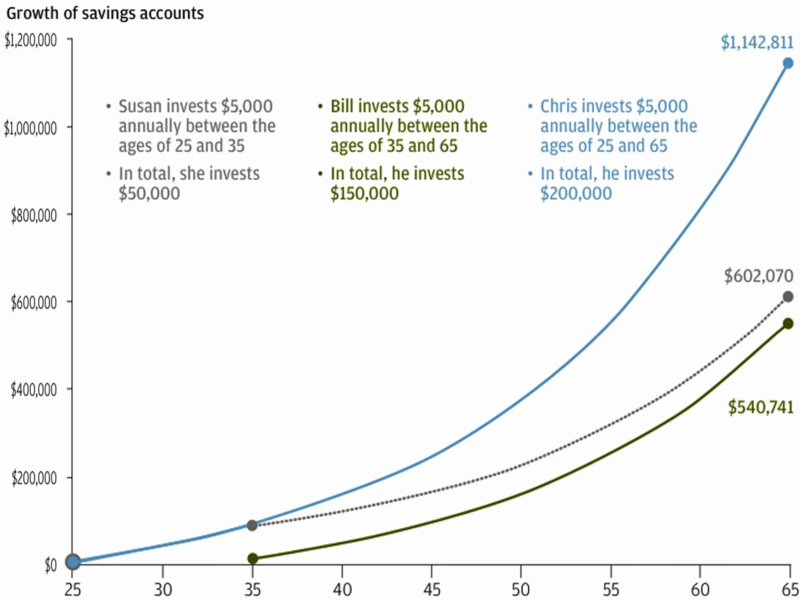 So while the $57K may seem like a decent annual amount at age 65, it will be (effectively) $34K at age 80. And the other problem is that by then there is nothing you can do. While its easy to stay on and work another year (or more) at age 65, by the time you hit 80, odds are you are done working even if you want to go back. Sorry for the long post. But hopefully this may give some folks some ideas as you get closer to "that day". I'm happy to answer any questions anyone may have. Excellent post! Very nicely lays out the benefits (or foregone benefits) of that extra year. The SS increases is definitely a kicker too, something my ole man is wrestling with right now actually. I would have to say one of the things folks neglect to consider when looking at their financial position is the effect inflation has later in years, and i'm glad you included that in your write up. A million dollars sounds like a fortune to some now... But with the effects of inflation over the course of 20 years, with rates that could surely increase soon, it's Net Present Value is not nearly as much as you think! I believe it is much more important to be planning for the retirement long before the do I work another year question comes up. Maybe put a few more dollars away each month during the working years so you can retire at age 65 or even a few years before that. You only have so much time to enjoy retirement, why put it off another year or three. Thanks Dawg. Yeah inflation is a b***h for sure. I always use examples like the movies or the cost of a house in presentations I do....how many people know what their parents paid for their first house? (I get answers like $20K, $15K etc.) then I ask who has bought a car recently. Or with movies....years ago you could go to the movies for $5 and that included popcorn etc. Nowadays after the tickets, the bushel of popcorn and the gallon of soda it can be $40 (or more) for two people. now when people are in retirement they will still want to go to the movies right? How much will it be? $75? $100? Blackrock has a great social security maximizer tool that you can use with a couple. It analyzes how best to get SS benefits (for many lower earning spouses they should start receiving at 62 on their earnings then switch to the higher paid spouses earnings at 65). It can make a big difference in total income received. My slant on retirement is the following. The less you spend, the less you need to make/have. Life choices that allow for reduced financial footprint to me are the backbone to making whatever you have stretch. Home paid for, a home you can afford to maintain, no need to borrow for any reason. Live simpler, spend less, enjoy life more. So many people try to retire and maintain a similar level of spending, as when they were working. Susan is the first section of blue line, then the dotted black line. Bill is the green line. Chris is the blue line. Susan invested only 50k between 25-35, and then stopped. At 65, that grew to 600k. Versus Bill, who saved at the same rate per month, but 3x more in total, from 35-45... and had LESS at the end. Chris, who invested at the same rate the whole time (25-65), eclipsed both of them, and only contributed 33% more than Bill. Don't be Bill if you can avoid it. Get as much of a head start as you can, as the compounding effects of interest are immense. Nice work for those thinking about it or getting close. They say it is a 5 year golden window, 5 years before and 5 years after you retire. Now I was lucky and got into law enforcement when the benefits were really good, but pay was so-so. Pay got better and benies stayed the same. I was also able to retire at 50 years old, but stayed until I was 55 to get full credit for years I worked at a lower rate, but it changed to a better rate at 55. I Retired at 56 years old, after 25 years of service. My 1st two years were at 2.7% @ 55. Meaning 2.7% of current pay times years of service. The remaining 23 years was at 3 @ 50, but I was able to purchase 3 years of time using a 401K, tax free. It was expensive at 35k a year, but the 401 covered all but 8k of it. So I ended up retiring with 28 years of service giving me 84% of my salary. Buying the 3 years gives me 9% on the total amount forever. if I had purchased early, it would have cost me around 50k for 5 years, but I was dumb. You can by military time still (4years) but not regular time and retirement is now 2.7 @ 57. Now something that did happen was taxes!! The first year I owed well over 5k as many of my deductions were gone!! (401k, medical, dues) and I had refinanced the house with such a low rate I had almost nothing to right off. I also still have a Roth and purchase metals time to time and SS has not kicked in yet. This is how it worked for me, but using the above, IF I had started early I would have so much more. Dawg I have a similar chart that I use with folks. It is powerful showing that unless you invest a LOT more its very hard to "catch up" to someone who started young. Belongs down in the financial section, if you all don't mind, I might figure out a way to move it there. My bad.....I can be a dumb-a** some times. ::) Thanks for moving it Kyle! This is what I am striving for. I have 18 more years before I reach the minimum age to retire and still be eligible for my pension at 55 years old. Some of the guys at retirement age out here now have more debt than I have now. Also a few have that problem and less in their savings than I have now. I talk to a bunch of them to see what they did right or wrong.